Less isn’t more; just enough is more. We’ve all heard of it before: “I want something simple.” People get tired of products that present them with so many choices that they don’t know where to start or where to go next. Unfortunately, this is probably going to end poorly for the part of you that wants to work 2-day weeks and take 20 vacations a year. If you want to be doing work that means something (and if you’re reading this, you probably do), then you need to be mindful of unpacking what your customer means when she uses the word simple. “Painless.” “A cinch.” “No sweat.” “Clear.” “Uncomplicated.” Does that sound more like what you want to be doing? If you really want to be making a difference, this is where you need to be. Giving your user every option possible all at the same volume, you’ve taken the easy way out. Easy for the product designer to build and hard for the user. A good Apple or Google product provides you with a simple interface that hides complexity beautifully. When you touch that button or fill in that text field, the product does a ton of work behind the scenes to give you what you want or need. 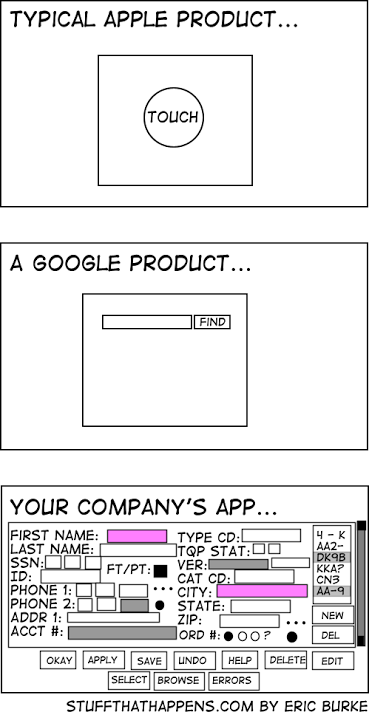 Hard for the product designer to build and easy for the user. Let’s continue to strive for simplicity and let all of the lazy, simplistic products out there die in the flames of indifference. This entry is filed under Marketing. Tags: product design, Strategy, usability You can follow any responses to this entry through the RSS 2.0 feed. You can skip to the end and leave a response. Pinging is currently not allowed.